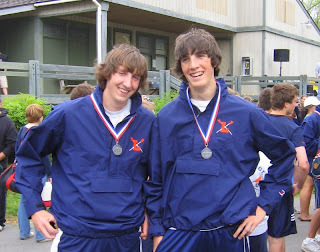 David and Chase had their last regatta yesterday. Both their boats made it to finals. Both their boats took a silver medal. and Chase had his Jr. Prom last night. He and Jordanne had a great time. poor Zach! Not even a mention! Thanks Jamie! and all of life still in front of them. it's a great age. Hi R, don't feel bad for Zach, he had the spotlight all winter when it was basketball season! his time will come again. Wow thats nice Pic Lisa dear..good day. Awesome job chase!! I am so proud of you!!! oh yea...good job to you and david on that boat thing too. and what a cute prom picture - man, a blast from the past! Thanks Kate! it does bring back good memories! congrats to your boys! And beautiful prom picture. Go Ryan boys! Big congrats.